Great fun at great prices! Foosball is a great game that children simply love. It is fast paced, great for building co-ordination and above all fun! Certain tables are designed specifically with kids in mind, and on this page we have put together a selection of some of the best tables in this category. All of these tables have been in the market for some time and have proven that they can stand up to the worst the kids can throw at them, as well as having safety features such as telescopic rods (where the play rod collapses into itself rather than passing through the table). 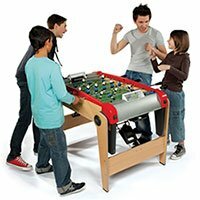 Most of these tables are around the 4ft size - the perfect size for smaller players to be able to use the whole length of the play field.